Patty Ozer studied both ballet and ethnic dance at Rollins College in Winter Park, Florida. She went on to study ballet, jazz, and modern at SUNY Binghamton where she received her B.A. Ms. Ozer has performed with the Ithaca Ballet, American Dance Asylum, and ’36 Dance Troupe in Binghamton, NY. She was a principal dancer with both the Elmira/Corning Ballet Company and the Twin Tier Ballet Theatre. At the School of Dance Arts, she taught ballet, jazz, tap, rhythmic dance, and acrobatics. 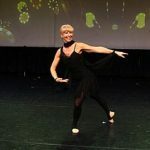 Patty enjoys working on the Story Ballet production each year and currently teaches jazz and ballet.